Space is expensive in cities, so why don’t we use it more efficiently? Land is a scarce and expensive resource in Auckland, as the city’s strong economy and natural amenities (sunlight! beaches! bush!) mean that a lot of people want to live in a relatively small area. But we often insist upon acting like urban space is worth nothing – why else would we have so many underutilised parking lots around the place? If your local fish and chip shop puts up the price of snapper fillets, some people will choose to buy terakihi instead. If wages for checkout operators increase, supermarkets will consider installing self-checkout counters to save on staff costs. We should expect the exact same thing to happen in the housing market. 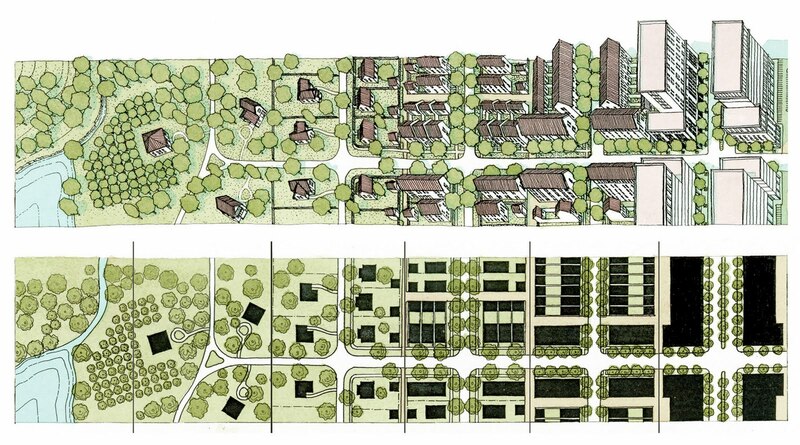 Broadly speaking, developers produce housing (H) using a mix of land (L) and capital (K), which we can loosely think of as the size of the building constructed on a site. So, for example, a ten-story apartment building will tend to have a quite high K/L ratio, while a detached house constructed on a large lot will have a low K/L ratio. Warning: Arithmetic ahead. Come back after three paragraphs if you don’t like that sort of thing. We can immediately observe a couple of crucial relationships from this equation. First, if the price of land increases (and the cost to build up doesn’t), we’d expect the K/L ratio to rise – in other words, we expect people to build taller buildings on more expensive land. Second, if the cost to build up decreases – for example, through a technological innovation such as steel-framed buildings or elevators – the K/L ratio should also rise. This explains the emergence of high-rise Manhattan in the early 20th century. Third, the relationship between changes to prices and changes in the K/L ratio will hold true in both low-density and high-density areas, although changes will occur at different rates. Armed with this economic framework, we can start to make sense of the way that various cities look. Here’s New York. It doesn’t look like this because it’s full of people who, unlike Aucklanders or Texans, have a mysterious preference for tall buildings. It looks like this because land is expensive and people have responded in a rational way. 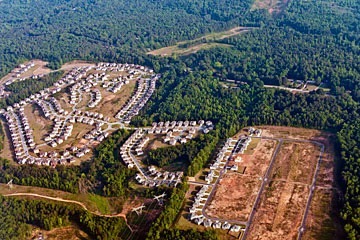 Here’s an aerial photograph of a suburb in Atlanta, Georgia, one of the world’s true hellholes. Once again, it doesn’t look like this because Georgians have some oddly-shaped utility function. It looks this way because land is cheap in Atlanta (and motorways are large). And here’s a picture of a typical Paris boulevard that somebody has photoshopped an enormous woman into for unknown reasons. While I’m sure many Parisians would claim that they have a unique cultural preference for seven-story apartment blocks with cafes underneath, Paris actually looks this way because land is expensive and developers have responded accordingly. With that in mind, how does Auckland stack up in terms of efficiently using its expensive land? Well, as it turns out we’re doing some smart things and some blitheringly idiotic things. Here’s a brief tour. The Northern Busway: Really smart. 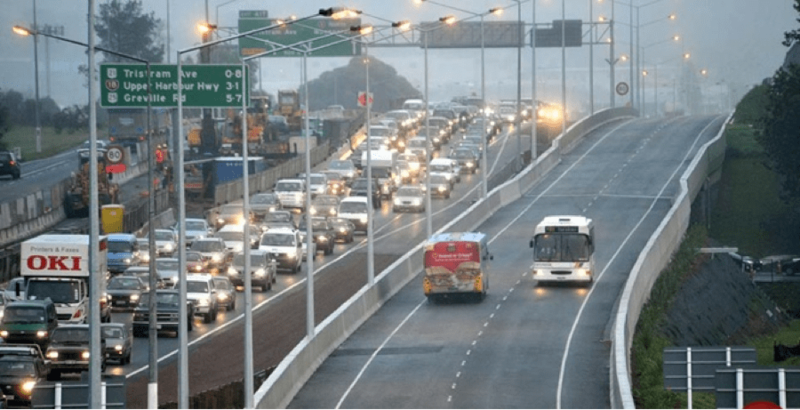 Adding two lanes for buses has enabled the capacity-constrained Auckland Harbour Bridge to carry many more commuters than it otherwise would have been able to do. Today, 40-45% of the people crossing the bridge during rush hour are on buses. It’s the most revolutionary transport investment to hit the Shore since the Harbour Bridge’s completion. Manukau Centre’s sea of carparks: Mind-bogglingly irrational. 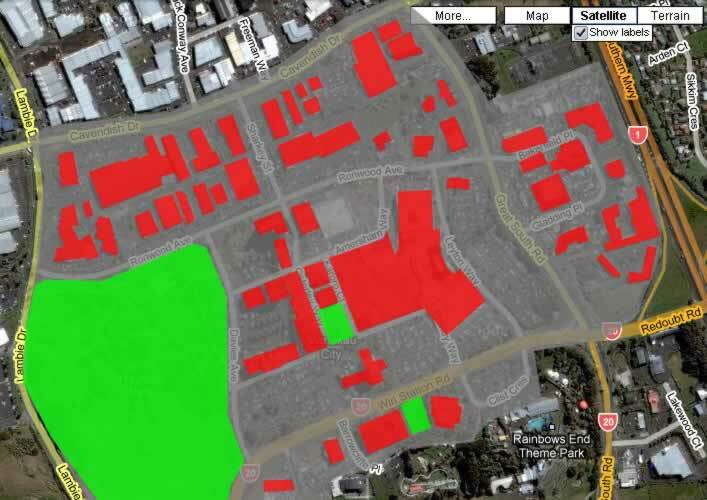 As the map shows, Manukau actually devotes more land to parking lots than to commercial uses. Whoever laid it out obviously hadn’t paid any attention to Auckland’s real estate prices. City centre shared spaces: Bloody clever idea. 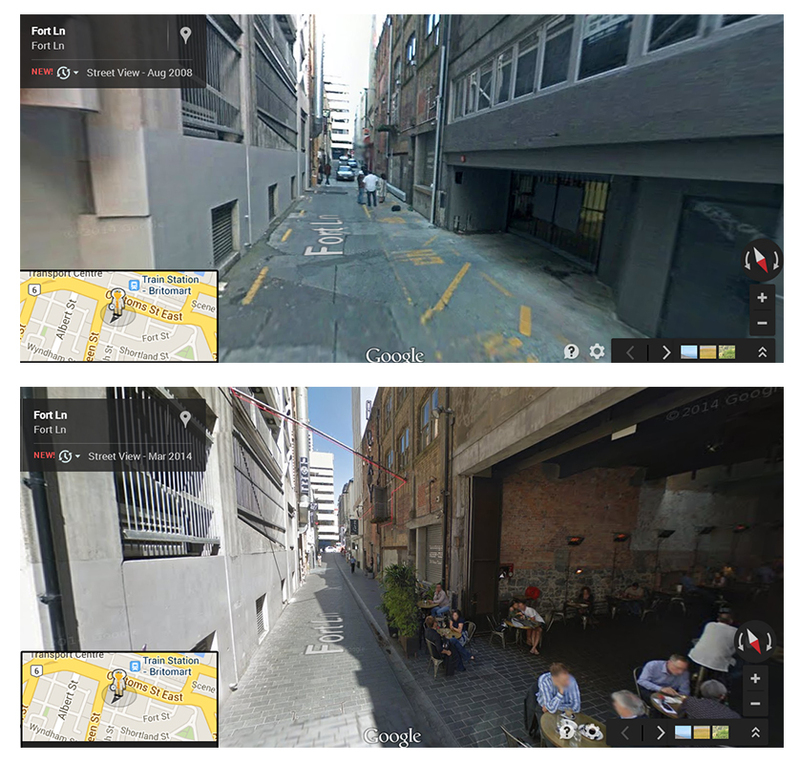 Turning service lanes and carparks into spaces for businesses to expand and people to enjoy allows us to make much better use of space in the city. Spaghetti Junction: A tortured trade-off. Demolishing a tenth of the city’s housing stock and abandoning much of the city centre to urban blight was undoubtedly an audacious gamble. The motorways move a lot of people, but we’re never going to reclaim the valuable, centrally located land that they occupy. Vancouver’s Skytrain – a future option for Auckland? Now this is about as cunning as a fox who’s just been appointed Professor of Cunning at Oxford University. Vancouver built a space-efficient (and cost-effective) transport system that created an incentive to build more densely. A perfect example of the virtuous cycle in which better transport options encourage more efficient use of land. Vancouver’s Skytrain also provides an impressive contrast to the effects of Spaghetti Junction on Auckland’s city centre, which raises the question – are we smart enough to start building like that, or are we going to carry on with the pretense that urban space is free? View the full video showing changes from 1985 to 2012. It is also because of the planning rules. I think it was the Montparnasse tower in the early 70,s that caused such an outcry they brought in strict rules limiting to 7 storeys. The price of land had nothing to do with it. If you go to La Defense they have some very large modern buildings that are a response to the price mechanism but central Paris is all about planning rules and the wide boulevards Hausmann built displacing far more people than our Ministry of Works could have. All done so they could get their army around quickly and to make the roads harder to barricade not because of urban design. It is good that someone has a good knowledge of history. Paris was rebuilt in 1860s with NO thought about property values or economics, and was probably less densely populated after the rebuild than before, as the streets were much wider and grand apartments replaced dense slums. Paris was rebuilt with a thought to land prices and construction costs- that how they paid for it. First Haussmann appropriated a corridor of land, then he built a sewer then he sold off the sides of the corridor to fund the capital works and laid a boulevard over the top (He used templates for streets based on rows of trees- lowered the architectural cost enormously). He also passed ordinances requiring building in stone, from quarries which were all owned and taxed under his post as prefect of the Seine. These were the rules that determined the way Paris has looked ever after, Funnily enough, other than the terminal projects in his boulevards (eg Garniers opera house- good luck finding a cost neutral method for that one) he ran quite a profitable organisation and provided the method which made 19th century cities so adaptable to things like railways, sewers and other forms of new infrastructure. Haussmann’s methods were to form the basis of continental city planning for the first part of the 20th century until they were co-opted by Le Corbusier (and other architects) and combined with more deterministic architectural theory to form the basis of modernism then urban design. Weren’t the boulevards also designed with such width to allow cavalry to charge down them? Presumably at rioting plebs, I think the city was redesigned before the Prussians besieged in 1870. When Manukau City Centre was laid out in 1970s the land was almost free. Every factory along Wiri Station Road had its own 9 hole golf course. AT regularly publish monthly patronage reports for the NEX seperately from other north shore buses. On the basis of those stats AT publish comparing with the Average daily traffic counts NZTA keep for the bridge you can say, if anything the portion using PT over the bridge at peak times has gone up not down since then. if you have evidence otherwise, glad to see it presented. That data on peak-time numbers is not publicly availiable so you do have to go back to the last time AT published the figure. However given that *overall* traffic volumes on the bridge have declined about 5% in the last year andand that *overall* bus patronage has risen 6.5% on the NEX and 4.2% on the rest of buses, one can assume the the figure is at least what is was back then. Page 96 – Bus mode share up from 25.2 to 34.5%; conversely private vehicles down over the same period. Unqualified success. Actually the reason economists use a Cobb-Douglas model for some many things from exogenous growth models to labour/capital substitution isnt because it is the best model but because so many economists didnt get past stage 1 calculus! Is “a tenth of the city” talking about the boundaries of what was then Auckland City Council, or the whole urban area? CMJ was something like 0.5 square kilometres so whatever it is compared to must have been 5 square kilometres and even the old Auckland had more housing than that. Check out the picture of Newton above and you will see only 1/3 to 1/2 the houses in that picture were removed for motorway, the rest were removed for commercial activities. It’s not just the loss of the land directly under the monster but the severance and blight that surrounds the whole area that it has caused. Go to Newton, have a look, it’s a wreck. The distance these areas have from the centre mean they should have higher value and contribute to the city’s economy more than they do currently. The proximity of the m’way and the severance it causes and the double-down on auto-dependency that the monotonal investment that it represents that causes this loss of value. The De Leuw Cather plan, unsurprisingly knowing the thinking of the period, was for SH1 to bypass the city, basically the SH20 route, and anyway to build the motorways after building the proposed bus/rail Rapid Transit. That would have been interesting. We didn’t do it, and if we had we would now have a better balanced city with two regional transport networks, and smaller motorways. Anyway, we can’t go back, but we sure as hell can stop pouring good money after bad by quadrupling down on just the one system and we can now add the missing bus/train Rapid Transit Network. Calling Atlanta a hellhole is a bit hyperbolic. Clearly massive dominant freeways are not efficient use of land, and as a non-driver I wouldn’t want to live there, but the people of Atlanta would probably consider New York and Paris hellholes with so many people in such a small area and such high land prices. Nice. 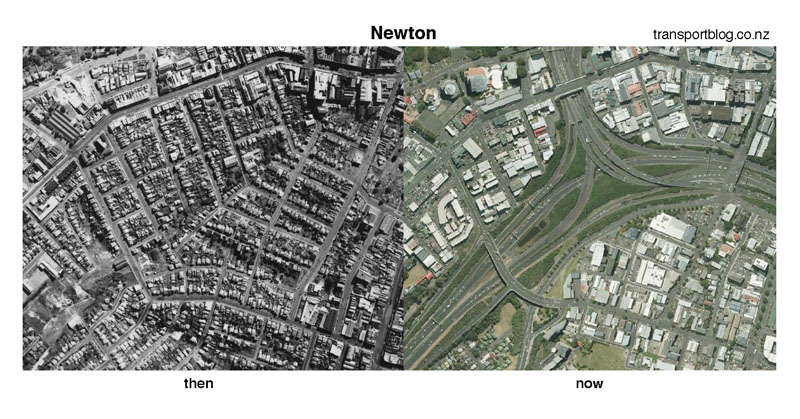 If traffic engineers hadn’t insisted on cutting down so many plane trees in Auckland to make driving “safer” (i.e. safer at fast speeds) Auckland would be much greener. I have read that population density of cities is more a cultural phenomenon than an economic one. Alain Bertaud had a chart of densities of all the cities he has worked in. Atlanta was at the low end extreme and I forget the high end city but it was in Asia. Auckland was quite high compared to other Anglo New World cities. Not that different from Stockholm and comparable with the low end of other European cities but a lot less dense compared to Asian cities. There was a massive difference in density between lowest to highest cities. Alain said the common factor was nobody was happy with their pop density it was either too high or too low. My explanation is that those Southern and Mid US cities are taking advantage of ‘free’ motorways provided by the Federal government (since the 1956 US Federal aid Highways Act). 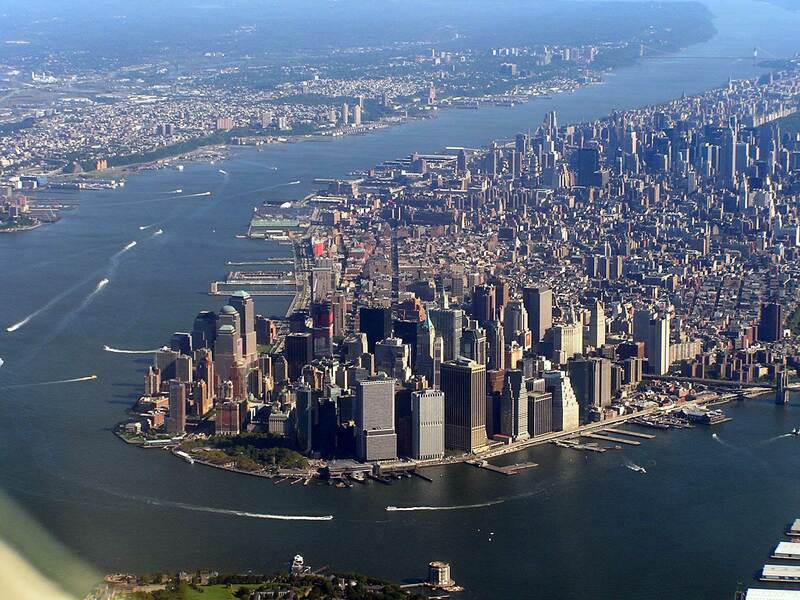 Plus those cities are not space constrained by coast lines/ mountains, UGB etc. IMHO it is an accident of history, public institutions and geography. With a little bit of culture and economics thrown in. Imagine if KiwiRail stopped being obstructive to passenger rail and creatively got into the real estate game too! Brendon I think your reading of Bertaud is a little simplistic. This cultural only cause of settlement pattern is much beloved by those like Pavletich et al; the sprawl advocates, because they look at say Atlanta v Barcelona (I’m sure you’ve seen AB’s comparison) and, absurdly, only see a cultural or language difference between these two cities. When of course there are two other very important shapers of urban form that this view ignores: 1. Physical Geography, and, the absolute key one of 2. Period of Settlement, which includes the subset of technology. The sprawling cities of the American South and West all had almost all of their growth in the mid and late 20thC- the age of the car. And are almost all on flat plains that offer very few barriers to horizontal spread. Yes American culture was very pro car in this period but this was also true of anywhere that access to this technology in this period. The French, for example, are mental about cars, have a huge motoring history and culture. The difference is that their cities were largely built before the car arrived. The mid to late 20C expansion of Paris is totally auto-dependant, a problem they are now fixing with an ambitious rail network to relieve dependency on the Periphique. The vast ex-urban ring road built in true 20thC style as the only thing needed, cf M25. If the wonderful Eixample of Barcelona have been built not in the 19thC but a century later, it would be as unloved and as unvisited as the vapid sprawl of Atalnta. It’s not that it was built by Catalans and Spaniards that it’s so good, but that it was built to walk, horse drawn, and railway scale. Which is not to completely discount the aesthetic standards and decisions of the people and the era. They did make very deliberate aesthetic decisions to copy the scale of Haussmann’s Paris for example, but the technology and economics of the era made that possible. The fact remains that pretty much every city in the world that anyone sees as having high place quality, like Paris and Barcelona, was largely formed before the age of the car, or it is the parts of those cities formed before this period that are admired. The car and the other technologies of the 20thC enable dispersal and scale that, in general, is considered undesirable. Urgent question is how to now, with our current technology and new economic realities, revive what is so good about these older cities. In my view, and hence my involvement here, is that the key is in the shape forming role of the transport systems we choose to invest in. And this idea that Anglo cultures only want crap cities is an erroneous barrier to understanding what can be done. The idea beloved of some of the crazier ends of the NZ sprawl advocacy machine that Texas offers any kind of ideal is totally absurd. The physical, economic, and yes cultural, differences between the cities of these South Pacific Islands and the continental, semi-arid, theocratic, semi feudal, Petro-State of Texas are too profound to ignore. But also, have these people actually been there, on want planet would anyone desire the form of those cities, in particular in contrast to the great cities of Europe? Also check out Tyson’s Corner Virginia it’s a similar situation to DC that Manukau is to Auckland CBD. It’s a suburb of DC that’s got the second most important CBD in the region after DC’s CBD (Bethesda and Rockville notwithstanding). They just opened the first half a new train line (Silver Line) last month and are undertaking one of the largest urban redevelopments in North America. It supposedly is an attempt at transit oriented redevelopment that is currently filled with seas of carparks like Manukau. It might also be paralleled to your Vancouver example in terms of build it and they will come. Also, the DC metro is a relatively new subway system but has spurred a great deal of reinvestment and redevelopment in DC propper over the last two decades. They also have a terrible Parisien style height limit and a similar Parisien style affinity for grand boulevards (was incidentally also designed by a Frenchman L’enfant). I just read recently about Tyson’s Corner and it is an amazing model for Manukau. High density living linked to the CBD by frequent fast rail. I might actually find a reason to go there then. NZ on Screen has an old 1982 documentary which outlines the thought (or lack of) that went into the creation of Otara and Manukau that resulted in the landuse waste you have highlighted in your post. Since the vast majority of commuters drive by themselves, the biggest waste of space in cities is the empty passenger sides of cars. By building and leasing the ultra-narrow Tango, Auckland could right-size commuter cars, resolve traffic congestion, avoid the staggering costs of widening roads, and build/lead the narrow car industry. You right on the money. Useful things cars, but an over reliance on them makes for an isolating and degraded city. Having been to Vancouver I can’t work out why Auckland has persisted in using rail as it’s prime form of Mass Transit. I feel we really missed out on an opportunity to ditch the rail and implement a skytrain like system which wouldn’t have required the extensive works for double tracking and electrification. I also believe it is easier to extend a skytrain system (to the airport for instance) as you don’t necessary need the corridor of land a traditional train system requires. Perhaps ultimately we could go the way of New York and rather than extend the train line to the airport we could build a new skytrain like line to move the passengers from the airport to the rail. Matthew, that’s because we already have rail corridors stretching west, east and south that are grossly underutilized and just itching to be unleashed. Upgrading them is a lot more effective than ignoring them to start afresh. However I do agree with your sentiment. Once the CRL linking the old lines together is complete the legacy network will be all fixed up and super efficient. For any *new* lines we could do very well to copy Vancouvers example. Indeed, skytrain is rail. It must be double tracked, and furthermore it has to be fully grade separated without any level crossings. It would have cost a lot more to rip out the western line and replace it with double tracked skytrain corridor than it would have to double track. In my opinion, rail to the shore should definitely be a driverless rail system like SkyTrain or the Singapore MRT. Airport rail really needs to be an extension of the existing heavy rail, otherwise it wont link in to the rest of the network. Perhaps the shore rail could eventually go down the Northern Busway, over the bridge, through the city (linking to CRL at Aotea) and on to the AMETI busway out East. Now that would be a real transport system! The important thing is not to jeopardise integration and continuity by haphazardly introducing multiple incompatible systems. If a strong demand exists say, for a North Shore to Papakura through-service then to make a North Shore line incompatible with Papakura will be incredibly unhelpful. If however, proper analysis shows that these two routes simply do not need to be paired and that a Skytrain-type service can provide all the necessary benefits as a self-contained operation in whatever corridor it occupies, then it could be justified. The success or otherwise of doing this lies very much in getting the analysis and planning right, and not assuming that any horse can run on any course. Barrow-pushing for a particular new system “because it works somewhere else”, or because it is allegedly cheaper to install, without due regard to its long-term integration with the legacy system, is a recipe for future regret. Sticking compatibly with the legacy system, while it might not be as glamorous as the new and may genuinely lack certain advantages, is nevertheless a reliable guarantee against ‘orphan’ systems which are later regretted. Not so say it shouldn’t be done. It just needs to be very carefully thought through, both now and projecting ahead. For instance, I fear Sydney is about to make a mistake in building its proposed North West Metro to be incompatible with the double-deck rolling stock on the rest of its system. This decision appears to be political rather than analytically-merited, and future generations might just curse them for this! And we must not forget just how much effort and expense goes into trying to make already “seamless” car journeys that little bit easier or quicker or less hassle. This is the benchmark against which many people will judge public transport. It pays to get it right. Some cities when developing a new area, they build the mass transport hub in the new area first. Then those cheap land will suddenly become attractive. Then the government can sell the land in higher prices to cover the cost. For example in Hong Kong, the Metro company is also a land and property developer. Yes that was my point about Kiwirail. Although it wouldn’t have to be exclusive to Kiwirail. You could have a skytrain or bus-lane transport + realestate companies. Even maybe cycle -lane company for smaller developments. Maybe all developers should have to offer two or more modes of transport (three if you count walking). The really clever thing would be for the State to do some of it at cost and keep a sizeable chunk of it in long-term leases so that it anchors land prices down. This is essentially what places like Japan did. Note its property bubble gently collapsed. It didn’t do the Kiwi, UK etc bounce back thing. Property prices in Tokyo are now cheaper than Auckland! Kiwi Rail are a disappointment but the hostility of the current government to all things on steel wheels is the wider problem. We don’t need to look outside NZ to see that model. It is exactly how the rail corridor in Wellington was developed by Labour in the 1940s. It was a huge success and was the plan for Chch and AKL until the 1949 National government decided its private sector buddies weren’t getting a big enough slice of the pie. Goosoid the Chris Harris article is hugely influential. Although I think that it doesn’t have to be 100% state developer led urban development -what we did in Wellington or 100% private development -what we do now. There is a case to be made for a balance of the two. I had assumed that the Corn laws debates were only about free trade. But recently I have done some reading and it seems it was also about the fight against the rentier class. Trade Unions were involved and made common cause with business (productive capital) to successfully fight the rentier class (unproductive capital). Back to Auckland, our CRL(Central Rail Link) project can have joint-venture with the property developers. The property developers can get priority developing rights above and near to the CRL stations if they subsidize the construction cost of the CRL. Well that is happening in a small way with Precinct Properties and the Downtown site, but the question is are we getting that relationship right? Auckland Council have put themselves in a very weak negotiating position as Precinct know they want CRL immediately no matter what the cost. Precinct have every reason to delay as they still do not have a major tenant. Well more precisely the penny pinching C&R Counciloors have put AC in a weaker position, as their constant attacks mean there is little credibility to any Council threat to force compulsory purchase of the site if PP try to drive too hard a bargain. These vision less haters would block any such move even though it could, in the longer run, be much much more cost effective for the ratepayer. As it is AC properties are doing little to nothing to reap the land value uplift that the CRL will bring. We know how they do it Hong Kong, but right now that’s too hard politically, requires a long term view above petty politics of C&R haters. Who owns the land under roads? This has to be a major untapped resource given the huge overroading in many parts of the city. At the very least the owners could lease it back to those freeloaders driving over it for free. Well ultimately, the Crown – as it ultimately owns all land in NZ. You don’t own land in NZ, you are granted a “bundle of rights” that lets you use the land. Otherwise, I imagine NZTA owns the motorways and the councils own local roads. As that is who pays to maintain them. Except, technically, Te Urewera National Park, which as of this year no-one “owns”. Same here. Issue is the RMA requires that everything be notified to the public and people have a say. The government (i.e. the Crown) still owns the road. I can’t imagine in a country like Japan things would be much different. The difference is that Japanese people fully accept PT infrastructure (and the use of PT) is a part of life in a city and needs to happen. So it wouldn’t be opposed so strongly. Aucklanders still like to imagine they live in some small country town where they can easily drive everywhere. A narrow minded culture also means using PT is seen as somehow degrading, despite the fact wealthy successful people all over the world use PT every day.